Once you've survived devouring a bucket of KFC for Christmas, eating your fill of osechi and perhaps braving the crush of people at a temple in the middle of the night on January 1, it's time to get into that other important Japanese New Year's tradition: getting your hands on a fukubukuro, or lucky bag. No idea what we're on about? Here's your one-stop Fukubukuro 101. 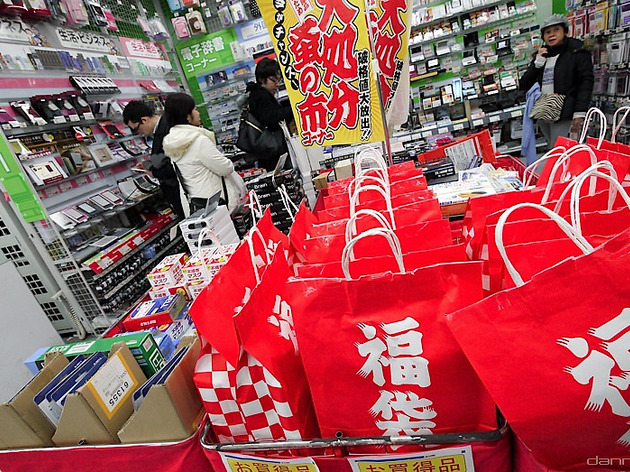 Fukubukuro (福袋, fuku means luck, fukuro – conjugated into bukuro – means bag) are sealed bags sold for a set price at shops across the country, from Starbucks to Isetan and Kinokuniya, around New Year's. They contain a variety of goodies from the store's lineup, and usually the contents of the bag would be anywhere from slightly to significantly more expensive if you were to buy each item separately. In recent years, the fukubukuro craze has spread beyond traditional retailers and concepts to a number of fancy restaurants, who fill the bags with their specialities in frozen, dried or vacuum-packed form, and 'experience' fukubukuro, which contain concert tickets or the like. The tradition's origins are usually traced back to a number of different stories, all of which start at some department store. One legend has it that the first fukubukuro was packed at Echigoya, the predecessor of Mitsukoshi, who started selling them in the Edo era (although Daimaru's predecessor is also laying claim to the same title). Another tale suggests that the lucky bags were invented by the predecessor of Matsuya Ginza at the end of the Meiji period, but none of the fukubukuro mentioned in these stories were sold exclusively for New Year's; the Daimaru record is dated to October. The truth is likely found somewhere in the middle, but it's safe to say that by the Showa era, if not earlier, other retailers had caught on after figuring out what a lucrative business the pouches were. From January 1. Exact dates vary by store, and some retailers even stagger their fukubukuro sales by location or only sell a set amount of bags per day. Recently, certain shops have actually added the option to book a bag online – so you can pick it up at an outlet of your choice in a civilised manner. Beware: fukubukuro sales can resemble war zones, with elderly ladies renowned for being particularly adept at using their elbows to get exactly what they want – even in the midst of a crush of people scrambling to get lucky (bags). At the most popular shops – mainly the fancy department and electronic stores, which sell notoriously well-filled fukubukuro – you'll likely have to queue up in the morning. And the fact that the grand New Year's sales also start around the same dates does not help. If you want to be extra sure you'll get what you paid (a lot less) for, you might be happy about the recent arrival of so-called 'spoiler lucky bags'. These are fukubukuro that are either see-through or have a list of what's in them next to the bag. We think it kind of defeats the purpose, but hey, they're out there. So you managed to bag yourself a fukubukuro from one of your favourite shops after dodging the hordes, but – shock, horror – you've gotten something that's not quite to your fancy (or in the case of clothes, doesn't actually fit or suit you). Enter fukubukuro item swapping. 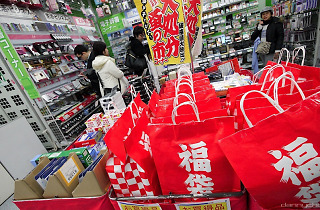 After the New Year's crush, many shoppers either try and swap amongst friends or, in a more lucrative move, turn to websites such as Yahoo Auction to either swap or sell their unwanted fukubukuro contents. Bargains are to be had, so even if you didn't go 'lucky bag' shopping, keep your eyes peeled online around the first half of January.